Mission Bio said today it has completed a $30 million Series B financing, with plans to expand and further develop its single-cell DNA genomics platform for oncology; broaden the scope of its activity into CRISPR and other gene editing applications; and expand overseas. Charlie Silver, Mission Bio co-founder and CEO, said in an interview his company aims to capitalize on growing interest in its Tapestri® platform, which can detect gene editing with the precision of single-cell resolution given its ability to identify mutation co-occurrence across distinct cell populations. Tapestri thus provides unprecedented insight into the consequences of gene editing experiments, making it of special interest to drug developers applying CRISPR and other gene editing technologies, according to the company. “The use of funds is really to expand the product offering, but especially expand into that market, so we can support that industry as it gets close to deploying these for patients,” Silver said. He would not disclose the gene-editing-based biopharmas working with Mission Bio, except to say they are companies that work in the chimeric antigen receptor T-cell (CAR-T) space. “What they’ve been interested in, and what we have provided them, is a way to quality-control their CAR-T systems,” Silver said. “It is important for the companies we work with, but really for the whole space, because these next-generation CAR-Ts include multiple edits onto cells to improve their specificity. “These companies are becoming more mindful that as you make multiple edits, you need a way of very sensitively understanding what you’ve edited in combinations across the cells that are then used for therapies, and also combinations of those cells—what you’ve edited off target,” Silver added. Tapestri is designed to target actionable mutations based on panels informed by leading researchers, with what Mission Bio says is an unprecedented capability to resolve clonal architecture through the detection of rare cancer cells that impact disease progression. The platform consists of an instrument, consumables and software designed to plug into existing next-generation sequencing (NGS) workflows. 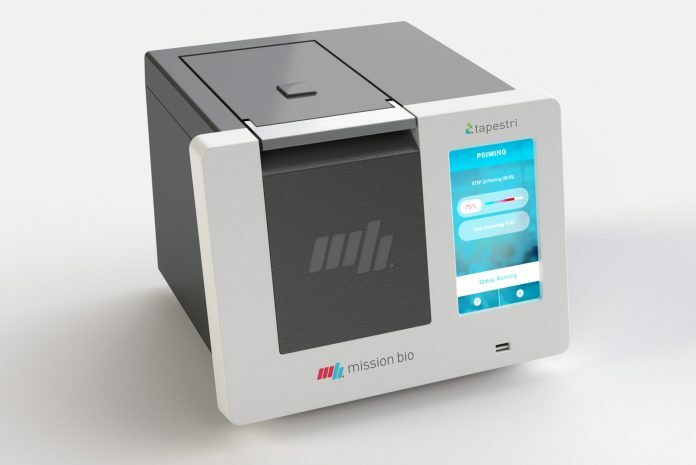 Mission Bio this fall announced a web-based application allowing researchers to design single-cell DNA panels to target their specific regions of interest, and rolled out a new chronic lymphocytic leukemia (CLL) panel. Also in recent weeks, the company announced participation in the National Institute of Standards and Technology (NIST) Genome Editing Consortium, and expanded the compatibility of Tapestri to include Illumina’s NovaSeq system as well as its MiSeq system—which according to Mission Bio enables customers to reduce their sequencing costs per run from roughly $1,100 to $200. Tapestri uses microfluidics to partition thousands of cells into individual droplets, with each cell occupying its own miniature reaction vessel. The cell is lysed, and its DNA is combined with barcoded beads, primers, and other reagents. The barcode indicates the cell’s identity and mutational profile. After thermal cycling, the product that comes out of Tapestri can be processed in NGS workflows, generating clonal information that may be analyzed by Mission Bio software. The Mission Bio system results in high-throughput single-cell DNA mutation sequencing and characterizes cell-to-cell genomic heterogeneity. Mission Bio says Tapestri can analyze tens of thousands of individual cells in parallel and is 50 times more sensitive than traditional NGS techniques, thus providing a more accurate lens on the complexity of disease—and facilitating more precise precision medicine. Earlier this year, Mission Bio researchers published a proof-of-concept paper in Genome Research describing how they sequenced longitudinally-collected acute myeloid leukemia (AML) tumor populations from two patients and genotyped up to 62 disease-relevant loci across more than 16,000 individual cells. Last month at the 60th American Society of Hematology Annual Meeting (ASH), Koichi Takahashi, M.D., of MD Anderson Cancer Center, followed up on the study by presenting results from his team creating the first single-cell atlas of AML, by sequencing more than 500,000 cells across 70 patients using Tapestri. Dr. Takahashi’s team reported unambiguously identifying co-occurrence and mutual exclusivity of those mutations across those 500,000+ cells, and uncovering a detailed evolutionary history of driver mutations in AML. Patients with higher clonal heterogeneity were found to have suffered worse clinical outcomes—a result that according to the e researchers suggests that the degree of clonal heterogeneity could be an indicator of which patients are more likely to have disease recurrence. Mission Bio’s technology is based on droplet microfluidics research conducted in 2014 in the high-throughput biology laboratory of Adam Abate, Ph.D., associate professor of bioengineering at the University of California, San Francisco (UCSF). That year the company was spun out of UCSF, initially taking space at QB3@953, an incubator of the California Institute for Quantitative Biosciences (QB3)—whose partners include UCSF, UC Berkeley and UC Santa Cruz. Mission Bio still maintains close ties to Dr. Abate’s lab. Now based in South San Francisco, Mission Bio says part of its financing will help it expand overseas, having begun selling its platform in Europe and the Asia-Pacific region. The company is not discussing distribution details, except to say they will vary from country to country and support Mission Bio’s goal of marketing its technology as widely as possible for research and patient care. Since its launch in October 2017, Tapestri has attracted as customers more than a dozen top-tier cancer research institutions, Mission Bio said. They include the NIH’s National Cancer Institute, Icahn School of Medicine at Mount Sinai, MD Anderson Cancer Center, Memorial Sloan Kettering Cancer Center, St. Jude Children’s Research Hospital, University of California San Francisco, the University of Pennsylvania, and Washington University School of Medicine in St. Louis. The same month of Tapestri’s launch, Mission Bio secured its $10 million Series A financing, led by Silicon Valley venture capital firm Mayfield Fund. The Series B financing brings to more than $50 million the total capital raised by Mission Bio. The new financing round saw two public companies—Agilent Technologies and LabCorp—join as investors along with Cota Capital, LAM Research Capital, and Mayfield. Silver said the presence of the public companies as investors does not portend an early exit via acquisition by them or other corporate giants within biopharma.